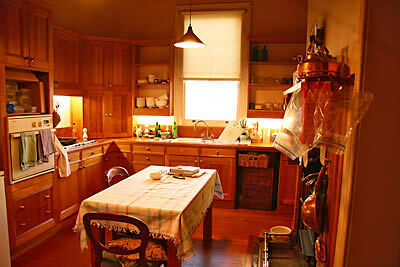 The old kitchen at Nonsuch has been remodelled precisely twice since 1886. In 1945 the Victorian kitchen was ripped out. At this time a new window was put into the kitchen in the south wall. Then the kitchen was again remodelled in the early 1980s when (for the time) a brand new country cottage pine kitchen was put in. Now it is time to attack it again. The 1980s renovation has proved dark and dreary. It made very poor use of space and the drawers and doors have not stood the test of time (many now don’t work). There is little storage (which in a big room is amazing … did the designer work to a brief to create as little storage space as possible in a room of generous proportions?). The past year has been spent in planning, the past three months in designing (the design is by Find & Design, who have done an amazing job), and now the designs are done, the appliances purchased, the contractors chosen, and early 2010 looks like the date when work can begin. 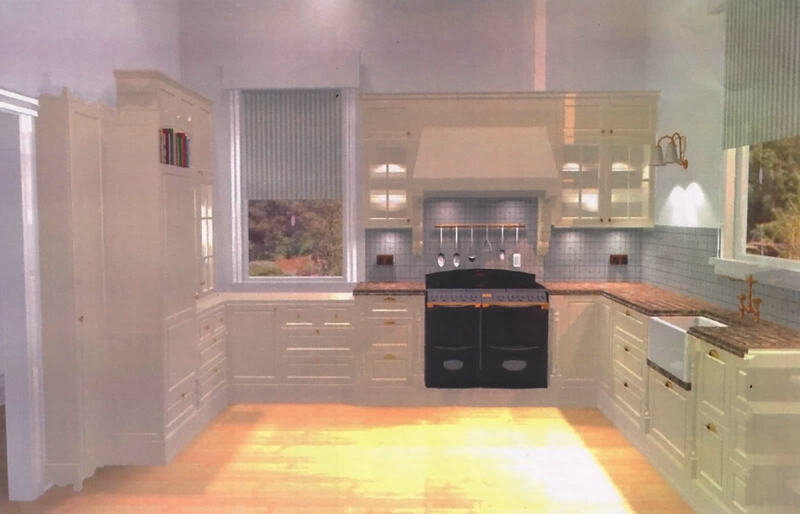 It will take a month of some pretty hefty work but hopefully I will have the kitchen of my dreams and Nonsuch a kitchen befitting its elegance. Apart from the living room, everything from that room backward is the servants’ part of the house – at the junction of back hall with main hall there is a big door which clearly delineates servants and gentleman’s part of the residence. 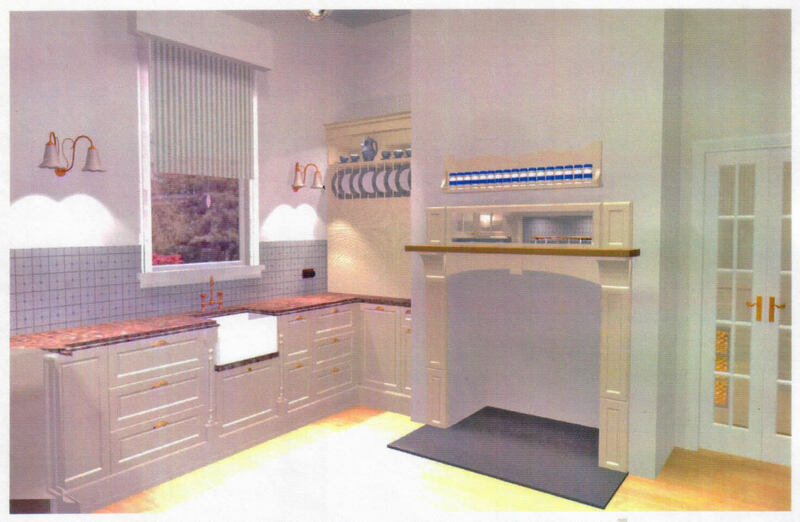 So there isn’t just a kitchen – there is more a kitchen suite. 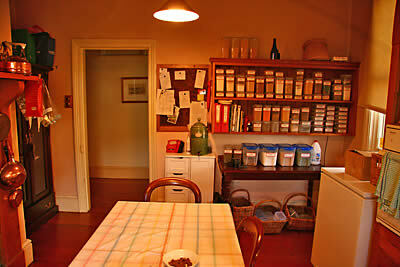 There is the back hallway, off which opens the main kitchen, the walk in pantry and the scullery. A scullery in a Victorian house was the ‘cool’ room of the house. In an era before fridges all the food items needing to remain cool would be kept and prepared here: meats and fish, dairy, jellies etc. It faces south, it has a heat vent in its ceiling, and so on and so forth, even today it remains the coolest room in the house. A utility room, the old laundry, opens off the scullery. I am having the kitchen proper, the pantry and the back hallway revamped. (The back hallway may be left a bit until the kitchen and pantry are finished.) I use the scullery now for my freezers and for storage – while it is in desperate need of attention, I can’t afford to touch it right now. Ditto the utility room. 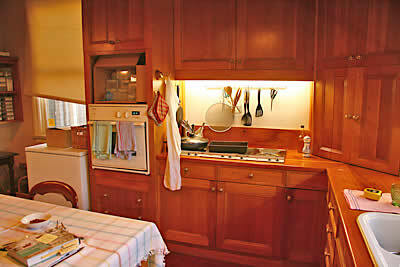 Here are some photos of the kitchen and pantry as it is now (November 2009). Click on the photos for larger ones. 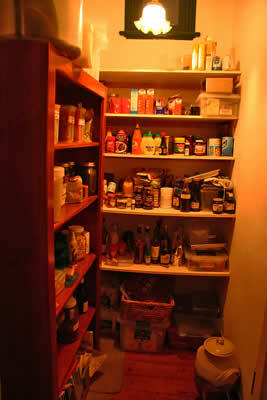 Photo 1: This is the walk in pantry attached to the kitchen. What can I say – shelves too deep and too high, horrendous to access, a nightmare to visit. The suggestion is that we close off this door and knock through a door to the left which will give it kitchen access (we’re in the back hallway here). Checkout all the old sauces and tubs of stuff that have been in there since the year dot. Photo2: Moving down the back hall and now looking into the door of the kitchen. I hate all the bloody pine! So 80s! None of the cupboards function very well, they are hard to reach – most of the drawers stick, the sink is so badly designed it is a nightmare to work with. The taps leak. There is no bench space where you need it most. Nuke the lot, I say. Photo 3: The fireplace. One of the few good points about the kitchen. I love the gas log stove I have in there, and the depth and height of the hearth (and its brass grate, which you can see in the previous photo). Yes, the paintwork on the walls really is that dingy. 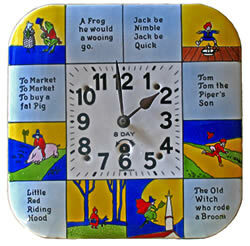 The nursery rhyme clock – one of my most beloved objects – has been in the family since the early 1920s and all my life it has hung in the kitchens of the houses I have lived in. It has ticked happily all that time. The only two things the kitchen has to retain is the clock and the gas log stove. 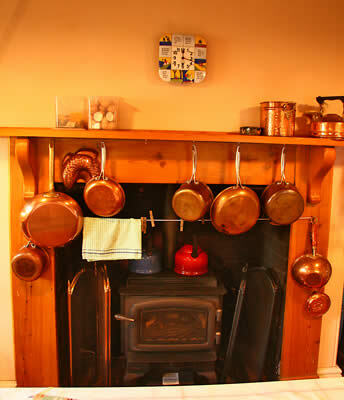 Note all the copper pans etc – I have lots of then and am looking forward to a proper rack to hang them from. Photo 4: The cooking area. Hateful electric hob, nightmare oven, cardboard box where once stood a microwave (I don’t need one). Extractor fan that doesn’t do its job. Destroy. I also loathe the wall oven arrangement – having the great bulky thing visually cut the room in half. Photo 5: Finally, looking back toward the door. Wasted space, totally. Hate this area. Need proper cupboards and bench space. The major building work will be to block off the pantry door into the back hallway and instead open up a door in the piece of wall it shares with the kitchen. This will give me access to the pantry from the kitchen and will also give me much greater storage within the pantry because of better use of wall space. 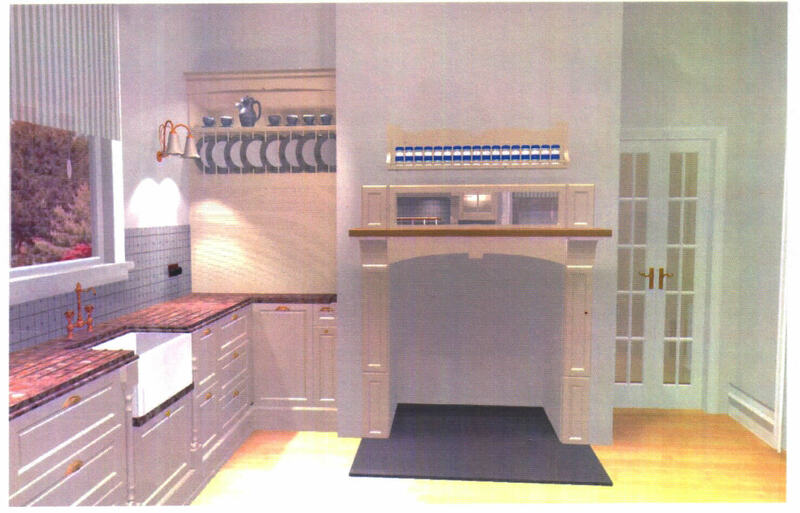 Overall, the design for the kitchen will be French Provincial. Lots of cream wood and glass, and featuring also beautifully detailed corbels and pilasters. 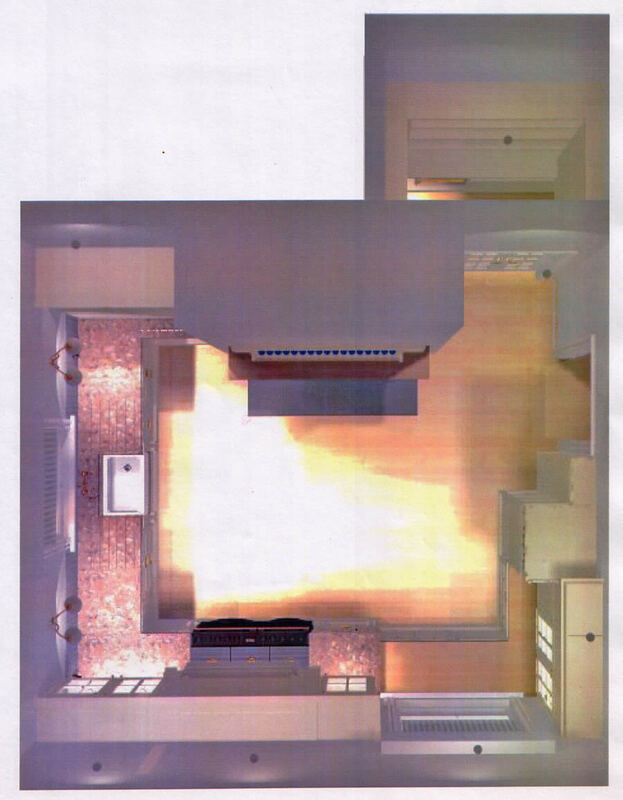 As you can see from the image, the main kitchen has a massive fire place inside it. Once this would have housed the wood stove. Now it houses a lovely Victorian-style gas log fire. On the wall opposite the current fireplace, I will have a ‘false’ chimney/fireplace/mantelpiece housing a double extractor fan, and under which will be the new Falcon stove (still bobbing about in the Atlantic somewhere on its way out from England). Both these features will have matching fire surrounds and mantelpieces, corbels, pilasters, lots of detailing; the real fireplace will also have a mirror built into the surround. It should look brilliant. 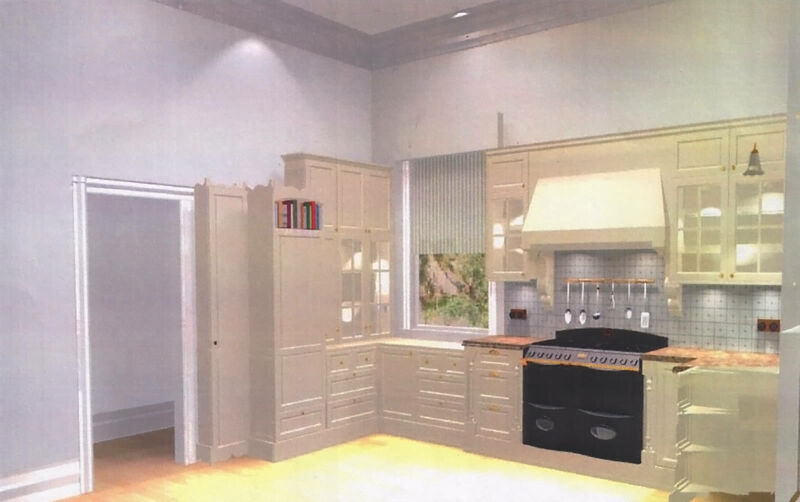 Also, as features, the kitchen will have a beautiful deep cornice put into it, it will have a central large hanging pot rack flanked by twin pendant lights (big white glass globe shades), all the overhead cabinets will be colonial glass-fronted and lit from within. I will have a plate rack (thank you Gods of kitchen design!) and a porcelain butler’s sink. Unless the cost turns out to be prohibitive, the bench tops will be in a lovely dark golden composite stone. All fittings will be brass. I have three blind corners and will have magic units inside them – one a lazy susan whose door magically folds back into the cupboard, and the other two probably La Mans units. All other under the bench top space will be drawers, not cupboards. Eventually the designer and I agreed on a plan. Click to see the larger image. And now, finally, we have some mockup images of how the kitchen will look. Again, click on these images for a larger view. The south wall. The window is the one installed in 1945 – it has badly cracked the wall so we need to fix that, and also fix the sash weights and chains in the window which are currently not working well. This is the main working wall containing the new stove (I am going to have the brass and black version). This picture does not show the detail of the corbels, which will be very fancy plaster work. Note the heritage kickers, which are unusual. The main benchtop is a composite material which looks like composite stonework but which is warm to the touch and gentle on glassware etc. The east door wall. The cabinetry conceals a Liebherr integrated fridge. As with the south wall, all the overhead cabinetry has top and bottom internal lighting. The shallow cupboard by the door will house my spice collection. The wooden flooring looks light, but it will be a rich, red-hued colour when freshly sanded and sealed. The west sink wall. I insisted on a porcelain butler’s sink. I’ve used them before and I love them to pieces. As with the south wall, all the drawers are asymmetrical. I didn’t want a kitchen where everything lined up. The space below the plate rack which looks blank is in fact a roller door concealing an appliance pantry – very deep, very handy. This will also have shelving inside it. The beautiful fireplace northern wall. (The fireplace does not show the black and brass cast iron gas stove currently there which will stay.) There is a mirror above the mantel (image shows it reflecting the southern wall), and above the mantel is a spice rack for my lovely (but largely useless) collection of Spode blue spice jars. This fireplace surround will have beautiful plasterwork corbels (not shown). You can also see clearly the new french doors into the pantry – giving kitchen access into the pantry for the first time since the house was built in 1886! 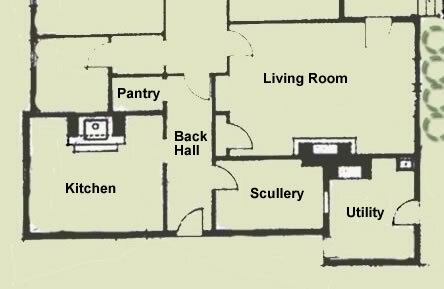 This is the first time the floor plan has been altered in the house. Finally, a hunstman cam angle. (In Australia hunstman spiders are huge, horrible things that usually lurk near the ceiling of a house – I loathe them.) 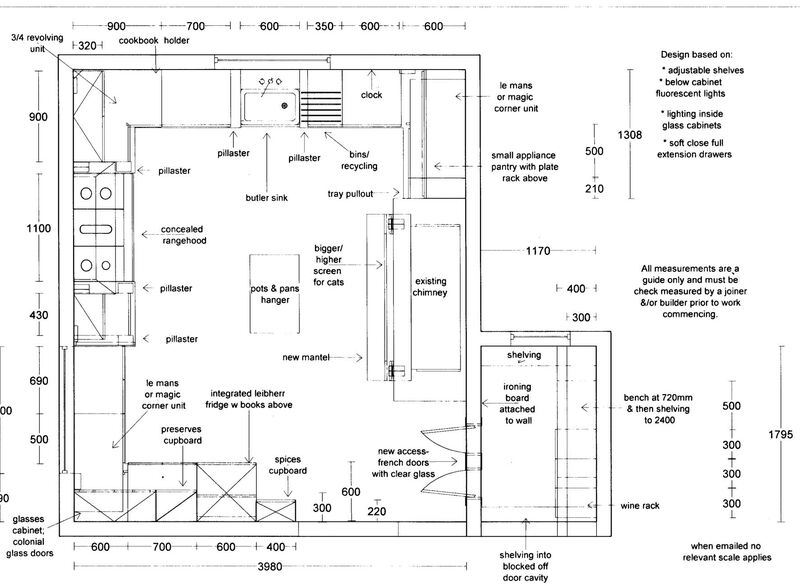 Image shows overall bench space and the pantry shelving. None of these images show what is happening in the centre of the room – a huge rectangular cast iron pot rack will be suspended from the ceiling, and under it a table and chairs. The only other thing happening in the kitchen is a lovely new deep ceiling cornice will be put in. So, until I have completed pictures to show you in the second quarter of 2010, that is it for now! You can keep up to speed on how things are going on the blog.